As one grows older, one often falls prey to joint problems, accidents, neurological illnesses or other age-related diseases. These often leave one with difficulty in maintaining balance and in need of a helping hand. How can one know which to get: walkers vs canes. It is important to choose a walking support device that is best suited for your particular needs. In order to make a decision, you need to evaluate the amount of weight support and manoeuvrability the device offers. Its also important to know the amount of physical exertion required to use the device, and one’s overall fitness level. In this article, we weigh the advantages and drawbacks of walkers vs canes. Canes are the most basic and least bulky of all mobility-assisting devices. A cane should be your mobility device of choice if you have mild to moderate balance and stability problems. There are primarily three types of canes, each catering to a different level of mobility problems. 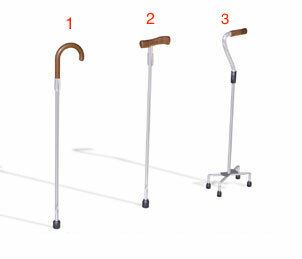 These walking aids are the most common form of canes with one single point of contact with the ground and a C-curve handle. They are intended for individuals who need supplementary but minimal aid with balance. Made out of wood or aluminum, they can be height adjustable or of a fixed height. They are usually prescribed to people with mild motor skill issues, resulting from either old age or lower-body injuries. Contrary to a curved handle, these canes feature a vertical grip. This allows for a firmer grip, decreased stress on the wrist and forearms and better control and stability overall. If a cane is intended to bear a decent amount of weight, a cane with an offset handle should be your pick of choice. These canes, with 3 or 4 points of contact with the ground allow for increased weight bearing and more stability than single point canes. Speed, however, is sacrificed at the cost of balance as to walk; all 4 points need to come in contact with the floor and which could significantly slow down your pace of walking. There are also newer types of cane that can be unfolded and turned into a chair. This is very useful when travelling and would need a seat to rest for short periods. Reminder: To use this, make sure the handle is in front of you when you sit down. This is the proper way; else it will be off balance and tend to fall. Canes are inexpensive, light, portable and easily manoeuvrable even in tight spaces. There are certain varieties of canes, which can even be folded and stored away when you don’t need them. Canes are the least intrusive in your personal and social lives, allowing you to fully immerse yourself in your work or recreational activities. If you feel slightly unsteady and off-balance while walking and could do with a little additional support, a secure walking cane should be your walking aid of choice. A cane does not support your body as a whole and only provides support to one side of your body. So make sure you hold your cane with your stronger arm, so as to compensate for the weakness of the other side of your body. A cane isn’t very stable, and if you’re holding it in an incorrect fashion, you might lose balance and fall. Using the wrong kind of cane might cause your hands and wrist to hurt, and may also cause back or knee pain. With a cane, you’re essentially walking by yourself with a bit of additional support. If you’re using a cane and you notice yourself getting tired and unable to walk after walking short distances, you might want to switch to a more supportive device. Before making a choice between walkers vs canes, the most important detail to be evaluated is, exactly how much of your body weight do you need to support on the mobility aiding device. Canes can support up to 25% of your bodyweight whereas walkers can bear up to 50%. 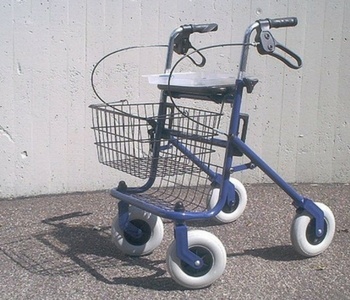 If a cane isn’t able to provide sufficient assistance, a walker might be a better solution. This 4-legged mobility device is designed to provide greater stability and is designed for people with significant balance issues with a high risk of falling. The walker’s wide base, along with its spaced out handles, allows the patient to lean in and settle their body weight on it. This makes walkers an excellent choice for those who have recently been through surgery and have significant ambulatory issues. There are primarily two types of walkers, each of which again has several variations. Made out of an aluminum frame, walkers have a very broad base and are often height-adjustable. They are intended for users who have adequate upper body strength and coordination necessary to lift the device up and move it forward. It is also lightweight. However, those who lack the strength required to raise a walker may opt for a rolling walker, which is a walker with wheels. The front wheels let the walker move forward with a slight push while the tightly affixed rear legs keep the walker from rolling away. A rollator is essentially a hybrid of a walker and a wheelchair featuring four wheels and hand brakes. It is ideal for someone who has problems with lifting a walker. Its swivelling wheels also make it very easy to turn around corners. Rolling walkers are mostly equipped with a padded seat and backrest, providing the patient with a ready spot for resting. These walking aid for seniors can be further customized with accessories like cup holders, baskets, and bells. 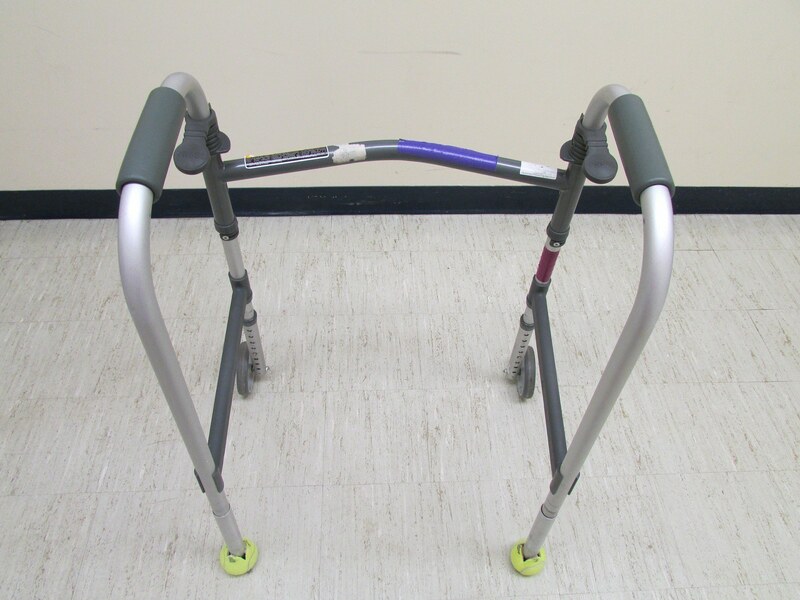 Walkers with their wide bases and four legs offer the highest amount of stability as compared to canes or crutches. Walkers are gripped with both hands and provide balance for the entire body and not just one side of it. Some varieties of walkers are foldable and therefore very portable. They are usually height adjustable, and the more expensive models even feature seats and backrests for relaxation. Patients may develop poor posture from resting their hands on the walker’s base and constantly leaning in for support and movement. A user must be careful to take small steps so that they don’t lose control of the walker and fall. While moving forward, a user should be mindful that they don’t push the walker out too far beyond their grip. Walkers require the simultaneous use of both of your arms and a fair amount of upper body strength to operate. 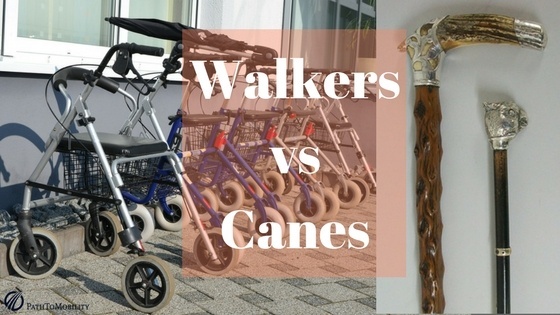 When making the decision between walkers vs canes, it is recommended to first, consult a medical professional and then making a personal choice as to what mobility aiding device is ideal for you. You may even choose to move back and forth between both medical walkers and cranes, depending on your comfort levels and the distance you intend to walk.